Every tea drinker knows that you can’t (or shouldn’t) use a travel mug for both coffee and tea. The coffee smell (and taste) can linger for a long time and this is problematic for those who like to drink tea all the time. In most cases true tea aficionados use a dedicated mug for their tea so that they don’t have to deal with this issue but for the occasional misuse of a dedicated mug (or the repair of a well seasoned coffee tumbler) you have some options. First things first, plastic mugs will retain that coffee smell and taste far longer than mugs made of ceramic, steel, porcelain, or glass. In some cases lower quality plastic mugs that are frequently used for coffee over a long period of time may not be able to fully recover. I used to throw away my plastic travel mugs after about 5 or 6 months of use because they never seemed to clean up. I did not want to trash them but I did not enjoy the smell of stale coffee every time I open it and put my hot brewed coffee. I love travel mugs and I use them every day, moreso when I started working from home. I put just about any drink and keep it by my side when working. It’s super convenient. But after a few months of regular use, that distinct “coffee smell” is really noticeable. It’s actually distracting. I felt like I am drinking something awful. At first, I just threw them in the back of the cabinet. Then, I would buy a new ones. The cycle happened over and over and by the end of the year, I’d have had 3 or 4 travel mugs that I didn’t want to use any more. It changed when I found out the best ways to get that “coffee smell” out of a travel mug. There are various reasons and conditions that cause “coffee smell” in a travel mug. Material Used for Travel Mugs – Plastic travel mugs are more prone to retaining the smell of its content compared to stainless steel. Especially if the plastic container suffer from scratches and abrasions, coffee oils, water, sugar and other liquid can penetrate between cracks. These build up will accumulate and it will begin to decompose, leaving a stale odor when you opened the the travel mug. Poor Cleaning Routine – Travel mugs should be cleaned after every use. However, many people tend to forget this. Especially if one uses a travel mug at work, it can be forgotten with unfinished coffee still lingering inside the mug. Worst case scenario, you left your travel mug at work over the weekend. Expect mold and mildew growing in your stale coffee. Improper Cleaning Procedures – Travel mugs come with specific cleaning and caring instructions. Manufacturers will tell you whether it’s dishwasher safe or hand wash only. These instructions are given to help you extend the life of your travel mugs. If you do otherwise, the surface of your travel mug will get abrasions and scratches. This can ruin your mug’s ability to keep your drink fresh. Coffee Oils – Coffee has natural oils. These oils give the flavorful aroma that we all love when we brew coffee grounds. Over time, these coffee oils accumulate on the interior surface of the travel mug. Oil is not easily dissolved in water. 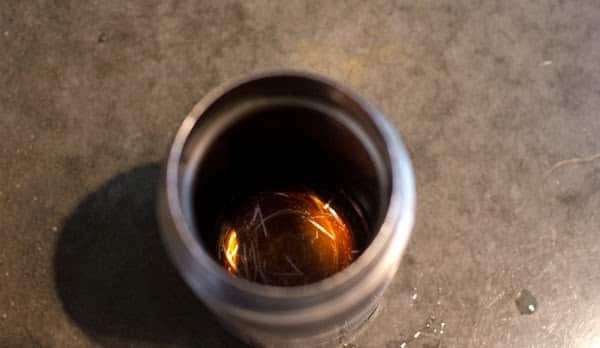 That’s why even if you wash your travel mug, these oils remain and over time, they will cause that “coffee smell”, too. If you have a dishwasher safe mug then you can try running it through a long cycle but for the vast majority of high end insulated travel mugs you are going to have to resort to hand washing and soaking in one of a few different solutions. The simplest and frequently most effective method is to hand wash your mug as well as all disassembled parts to the lid with a good bottle brush, dish soap, and hot water. Once cleaned you then soak the interior of the mug overnight with a solution of 1 part white vinegar to 1 part water. The lid should be disassembled as much as possible and submerged in the same solution in a bowl to remove the odor for it as well. In all but the most extreme cases this will work just fine but for troublesome mugs or for the sensitive nose you can also try using denture cleaning tablets instead of vinegar. These tablets are designed to clean and remove odors and may be effective at eliminating some odors that the vinegar leaves behind. Here is a run down of some common ways to deep clean a coffee mug. Use baking soda to remove the coffee smell. Put 1 teaspoon of baking soda in the tumbler and fill in with lukewarm water. Let it sit for 60 minutes. Others let it stay overnight for deep cleaning. Rinse off with lukewarm water. If there are dark stains, make a baking soda paste. Mix three parts of baking soda to one part water. Rub on with a damp sponge and rinse off with luke warm water. Other suggest using denture cleaner tablets. Place two denture tablets for regular cleaning. For hard stains and smell, place 4 or 5 tablets. Let it dissolve and leave it for an hour or overnight, for deep cleaning. Vinegar is an effective cleaning and deodorizing agent. Fill a basin with hot water. Add ½ cup of vinegar. Soak the lid and the tumbler in the basin. This amazing solution works like magic. Put the lid on and shake it around and let it soak for a few minutes. Take the lid off and pour the mixture out on & around the lid & seals. Rinse out with hot water. This may sound unlikely but some travel mug owners swear to its amazing effect. Get a shot of vodka. Put the vodka inside the tumbler. Swirl and shake the vodka. The alcohol, which is a less-polar solvent, help gets rid off the oil build up. Clean it With a Newspaper! Who would have thought that newspaper can be a cleaner? Wash your travel mug with mild detergent and warm water. Stuff the tumbler with newspaper. When the newspaper gets damp, discard it. Repeat until the newspaper comes out dry. What if the coffee smell remains? Most often than not, one or a combination of two processes can help remove the coffee smell from your travel mug. But if all things fail you still have an option. This is most true when you are using plastic travel mugs, since they are more prone to absorb smell from foods and drinks. Some people have reported success with soaking their tumblers in bleach/water mixtures and then thoroughly rinsing and washing them afterwards. I’mm not a fan of this because I don’t like the idea of putting bleach in my travel mug but to each his own. In most cases high quality plastic mugs can be repaired but the cheaper the quality the more difficult it may be to clean up the smell entirely. Preaching to the choir here but it’s always recommended to have a dedicated mug for coffee and try to keep the coffee out of other travel mugs. If you use coffee only ever now and then in your mugs then you don’t even need a great mug, just something to keep your non-coffee mugs smelling fresh and tasting pure. Ohh, and please do leave your own super-secret tips to getting rid of coffee smells in the comments below. I’m sure there are a few awesome untapped ideas out there.